Microtubules form crucial dynamic structural cellular components of the cell and are composed of the alpha beta tubulin heterodimers. Microtubules are involved in a wide variety of functions in the cell such as attribution to cell shape, motility, intracellular trafficking and mitotic spindle formation. Owing to these reasons, tubulin and microtubules have gained significant interest as important targets for cancer therapy. A review of the existing microtubule targeting drugs specifies that these agents can be categorised into two of the major categories: Microtubule stabilizing agents such as paclitaxel, docetaxel, epothilones, and discodermolide which bind to the tubulin polymer and stabilize the microtubules, microtubule destabilizing agents such as vinca alkaloids, colchicine and combretastatins which bind to tubulin dimers and cause destabilization. These agents ultimately alter the equilibrium between tubulin and microtubule resulting in disruption of mitotic spindle, thereby effecting a critical transition in the cell cycle, leading to cell death. Further, clinical studies of these agents are limited by toxicity effects and emergence of drug resistance. 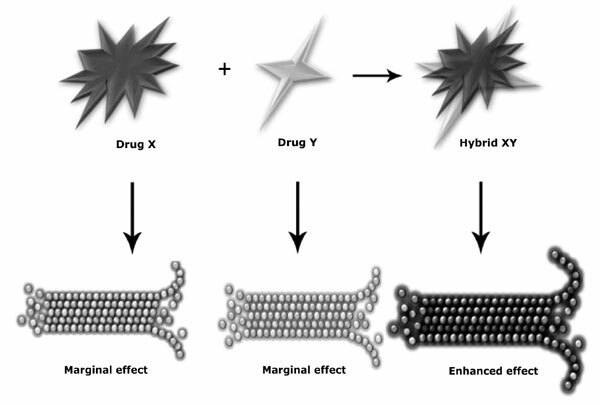 The hybrid drugs are a combination of two or more drugs wherein pharmacophores are incorporated into a single molecule to interact with multiple targets and enhance the cytotoxic action with minimal side effects. Such hybrid regimens can improve therapeutic efficacy and reduce drug toxicity. Therefore, studies on new hybrids with such biological properties form important part in chemistry. In this review, we present an overview of various recent hybrids of colchicines, combretastatin, phodophyllotoxin, etc generated by combination among themselves through linkers or with other pharmacophores and their properties like tubulin stabilization and tubulin destabilization. We also attempted to provide chemistry, toxicity, resistance, side effects of these molecular hybrids acting as microtubule targeting drugs. Keywords: Paclitaxel, Docetaxel, Epothilones, Vinca Alkaloids, Colchicine, Cancer Chemotherapeutics. Keywords:Paclitaxel, Docetaxel, Epothilones, Vinca Alkaloids, Colchicine, Cancer Chemotherapeutics. Abstract:Microtubules form crucial dynamic structural cellular components of the cell and are composed of the alpha beta tubulin heterodimers. Microtubules are involved in a wide variety of functions in the cell such as attribution to cell shape, motility, intracellular trafficking and mitotic spindle formation. Owing to these reasons, tubulin and microtubules have gained significant interest as important targets for cancer therapy. A review of the existing microtubule targeting drugs specifies that these agents can be categorised into two of the major categories: Microtubule stabilizing agents such as paclitaxel, docetaxel, epothilones, and discodermolide which bind to the tubulin polymer and stabilize the microtubules, microtubule destabilizing agents such as vinca alkaloids, colchicine and combretastatins which bind to tubulin dimers and cause destabilization. These agents ultimately alter the equilibrium between tubulin and microtubule resulting in disruption of mitotic spindle, thereby effecting a critical transition in the cell cycle, leading to cell death. Further, clinical studies of these agents are limited by toxicity effects and emergence of drug resistance. The hybrid drugs are a combination of two or more drugs wherein pharmacophores are incorporated into a single molecule to interact with multiple targets and enhance the cytotoxic action with minimal side effects. Such hybrid regimens can improve therapeutic efficacy and reduce drug toxicity. Therefore, studies on new hybrids with such biological properties form important part in chemistry. In this review, we present an overview of various recent hybrids of colchicines, combretastatin, phodophyllotoxin, etc generated by combination among themselves through linkers or with other pharmacophores and their properties like tubulin stabilization and tubulin destabilization. We also attempted to provide chemistry, toxicity, resistance, side effects of these molecular hybrids acting as microtubule targeting drugs.